> Over the past few days, the first crop of starting pitchers have been plucked off the free agent market: Jeremy Guthrie signed a three-year pact to stay with the Royals, while Hiroki Kuroda returned to the Yankees on a one-year deal. Personally, I was gunning for the Brewers to somehow nab Kuroda, but it was unlikely the whole time. With Kuroda gone, the top veteran starters on the market are Zack Greinke, Anibal Sanchez, Dan Haren, Edwin Jackson, Brandon McCarthy, Ryan Dempster, and Kyle Lohse, and there are two names on that list whom I think the Brewers have a good chance at signing. Greinke and Sanchez are too expensive (Sanchez is asking for six years and $90 million). McCarthy is a great pitcher, but his injury history is going to hurt the type of deal he gets. Haren and Jackson are both veterans I wouldn’t mind having, but there are safer options. And those safer options- safest for the Brewers, at least- are Dempster and Lohse. 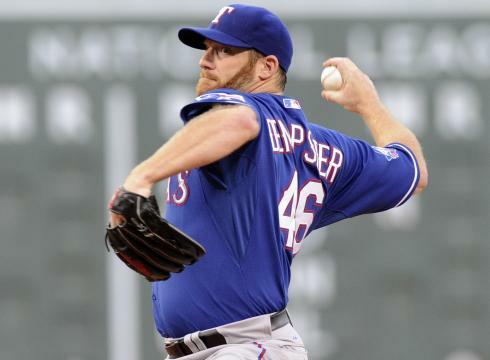 While he was in the National League with the Cubs last year, Dempster was one of the best pitchers in the game. His 5-5 record with the Chicago doesn’t tell how good he was, but his 2.25 ERA does. He also had a streak of over 30 consecutive scoreless innings going for a while. He did spend a bit of time on the disabled list, but has a history of being a relatively healthy pitcher. Things fell apart for Dempster after he was traded to Texas at the Trade Deadline, as he posted a 5.09 ERA in 12 starts with them (despite putting up a 7-3 record). That was Dempster’s first time pitching full-time in the American League, however; it’s safe to say he’d return to form once he returned to the NL. Lohse, meanwhile, was the surprise ace of the Cardinals’ staff in 2012. The 34-year old started his career with the Twins in 2001, but didn’t really have an overall solid year until 2008 (15-6, 3.78 ERA), his first year with the Cards. 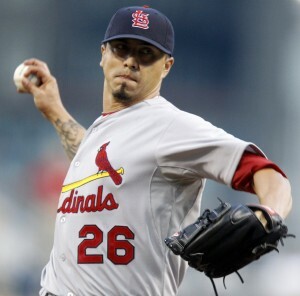 Lohse had off-years in 2009 and 2010 due to injuries, but showed signs that he was getting his stuff back in 2011, when he went 14-8 with a 3.39 ERA. He finally put it all together in 2012, going 16-3 with a 2.86 ERA and placing seventh in the NL Cy Young balloting. Though Lohse had a somewhat inconsistent career early on, the trends of the last few years tell us that he probably isn’t going to regress anytime soon. The reason I picked these two guys as the best potential targets for the Brewers is because they are both groundball pitchers. Seeing as Miller Park is a hitter’s paradise, a groundball pitcher would be a nice addition, as long as the Brewers are interested in picking up a starter. And, the recent performance of flyball pitchers at Miller Park hasn’t been great. Jeff Suppan is my prime example, but it’s worth noting that there was a reason that Shaun Marcum was significantly better on the road. If I had to choose between the two, I’d go with Dempster. Most would probably pick Lohse because his basic numbers over the past few seasons have been better, but there are a few reasons I’m taking Dempster. The main reason is that Dempster, though he’s considered a groundball pitcher, picks up his fair share of strikeouts as well, which is always something I look for in a pitcher. Some say strikeouts are insignificant and are overrated. But, the more a pitcher is striking batters out, the less the ball is being put in play, and the opposition won’t score as many runs. That’s my take on strikeouts, at least, even if they drive up pitch count in some cases. Anyway, Dempster had a K/9 of 8.0 in 2012 (career 7.8), while Lohse’s was 6.1 (career 5.6). I think Dempster’s numbers would play better at Miller Park than Lohse’s. Not to mention the huge success that Dempster has had at Miller Park in his career. He has a 2.66 ERA there, so he seems immune to the fact that Miller Park is considered a hitter’s park (probably because he’s a groundball pitcher). Meanwhile, Lohse has a terrible 6.95 ERA at the Brewers’ home. Yet another reason Dempster is the safer play. So far this offseason, the only free agent starter the Brewers have expressed interest in is Dempster (obviously they want Greinke, but know they aren’t going to get him). Perhaps they’re going through the same thought process, seeing as Dempster appears to be an affordable, yet effective option for the Brewers. > The Padres are reportedly interested in Shaun Marcum. To be honest, I would have been okay with the Brewers bringing him back on a two-year deal or something along those lines. But, ever since last offseason, I’ve been getting the impression that Marcum and the Brewers’ front office don’t get along very well. Otherwise I’d think Marcum would want to stay. Dodgers: Signed Osvaldo Martinez to a minor league deal. Phillies: Signed Josh Fields to a minor league deal. Hopefully the riot was at least a few more fans than that. 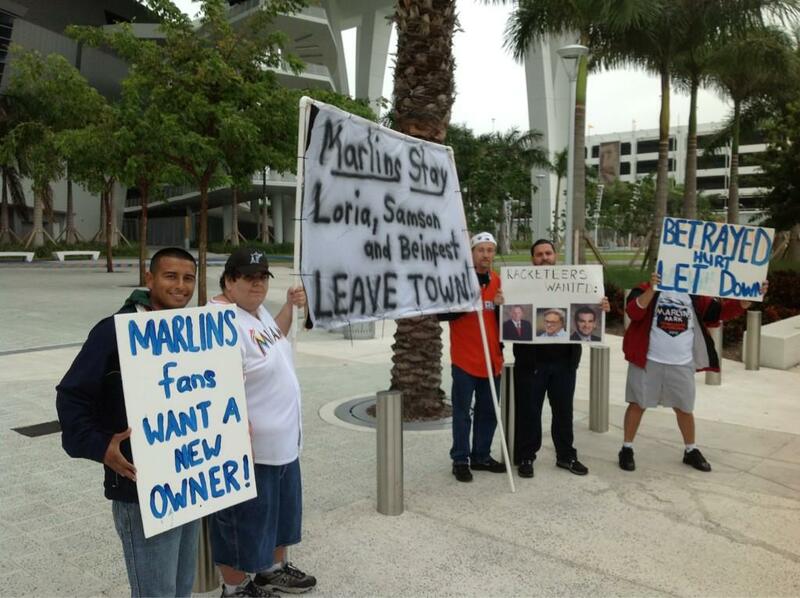 But I wouldn’t be at all surprised if that’s the entire Marlins fanbase right there.